License4J is a Java library for java software licensing. It is designed to be easy to use and integrate in your Java application. Unlike other licensing libraries it has many licensing features defined and performs validation on required features. License4J supports floating licenses. It can create floating licenses and serve with free floating license server software. License4J can generate license text, floating license text and license keys. License text includes features listed below and can be plain text or encrypted to hide content from customers. Serial numbers can be generated based on a customer name or company or both; or completely not based on anything. 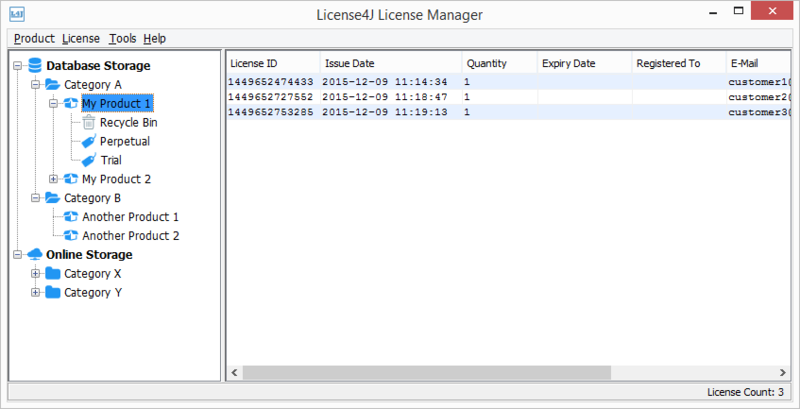 License4J comes with License Manager and Serial Number Manager GUI applications to generate and store software license text and license keys. Download package includes runtime library, development library, documentation, License Manager GUI tool, Hardware ID viewer application, and example applications. You can download and test License4J, the only limitation is that created license files will have 10 days expiration feature set, and serial number will be with some fields disabled. You can buy and install a valid license at any time. With each License Manager purchase an Online.License4J account is created with 1000 license limit, with Online.License4J system you can auto generate licenses with http posts and activate licenses online.